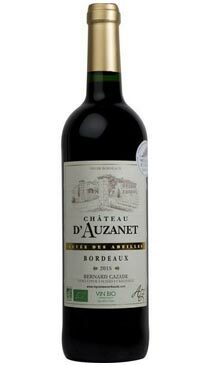 Château D’Auzanet has belonged to the Cazade family for three generations. Situated in the southeastern section of the AOC Bordeaux appellation, on slopes hewn into the right bank of the Garonne. Bernard Cazade has been passionately interested in winegrowing since he was a child and he is deeply attached to this superb terroir. He has developed the vineyard that he inherited from his father. A long time ago, he began to focus on preserving this terroir for future generations. He committed himself to minimizing environmental impacts and began to run his vineyard according to very strict organic farming principles. Cuvée des Abeilles is an organic wine from Château d’Auzanet. Made from a blend of Merlot, Cabernet Franc, Cabernet Sauvignon, and Malbec grown on south-facing slopes of calcareous clay, rich in mineral and organic elements on the banks of the Garonne river. The grapes are harvested when fully ripe, sorted, then put into vats for a controlled alcoholic fermentation with moderate pumpovers at moderate temperature (28°C max). Maceration is short to give priority to extraction of the fruit. Following the alcoholic fermentation, the wines are aged in stainless steel vats. Beautiful deep ruby red. Generous, expressive nose that opens up to reveal dark fruit aromas (cassis, blackberry, prune) with a hint of spice. A full body and rich texture with lots of ripe red berry and plum and a nice freshness on the palate. The soft, chewy palate lingers to a tannic finish with creamy extract. A very fine Bordeaux from a reference vintage year!